This post was made possible by Squarespace through compensation. The actual contents and opinions are the sole views of the author, who maintains editorial independence, even when a post is sponsored. For more details, please read our disclaimer. Squarespace has been around for longer than you’d think. Squarespace was founded in 2004. Since then they’ve been trying to simplify web design. It’s in the last few years — with a podcast sponsorship campaign of gargantuan proportions — that Squarespace has really started to attract attention. As one of the writers here at MakeUseOf who has web design experience, I was asked to take a look. 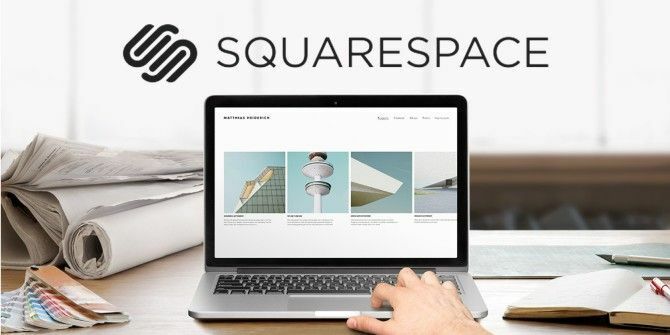 While at first glance Squarespace may seem more like a competitor to Wix or any of the other free website creators, the quality of features and depth of customisability puts them in the same league as WordPress and other professional Content Management Systems (CMS). Web designers in particular should take note. Squarespace offers a compelling developer platform. There may not be quite the same range of additional features that you can get with a WordPress site but your clients are far less likely break the site by accident. For the average user, Squarespace is just as good for anyone looking to quickly set up a well-designed site. If you’re looking to build a new website, you’re in luck — we have a 10 percent discount coupon for Squarespace to offer. Enter the code ‘MAKEUSEOF‘ after your trial ends to receive 10 percent off. New signups only. We’re also giving away two 1-year Professional plans, absolutely free. Read on if you’re keen on winning it for yourself. That’s the main thing you get with Squarespace: a good looking site that’s fully functional, uses the most modern web technologies and works responsively on all devices. With WordPress, the stock themes aren’t great — and many of the paid ones seem like replicas of each other. Squarespace doesn’t have this issue; even unmodified, all Squarespace themes look beautiful. 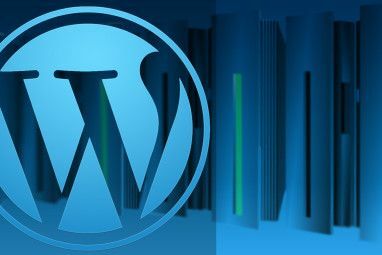 The caveat is that you get far more flexibility with WordPress. While you get the freedom to make an extremely ugly site, you also get the freedom to build a site like MakeUseOf — which runs on WordPress. There’s something for everyone. If you’re just getting started and want a simple, single page website Squarespace 7’s new Cover Pages are perfect. Cover Pages are designed to showcase a single thing — whether it’s a soon-to-launch startup, portfolio, new album or trailer for a short film — simply and beautifully. While you don’t get the power of a full Squarespace site, they’re quicker to set up. In less than 10 minutes, you can have a Cover Page online. Simply sign up for a Squarespace trial account, add a new Cover Page and choose from one of the available templates. Once you’ve done that, upload any images, videos and other content you want and your site will be ready to go live. In mere minutes you’ll have a great site that links to your social media accounts, your other projects or anything else you want. If, on the other hand, you’re a business looking for a site to sell your products or a writer looking to carve out your niche, you can build a full online store or awesome blog with ease. My suggestion is to check out the templates page on Squarespace’s site. Have a look through and see what you like. You can always change theme at a later date — all Squarespace’s themes are completely interchangeable. If you’d previously had a look but didn’t find anything to your fancy you should look again now; Squarespace 7 has added 15 new themes. One of my favourites is Shift. Squarespace worked with a personal hero of mine — the free climber Alex Honnold — to develop a bold, image heavy theme. If you want something even simpler, Om is also worth checking out. It’s a great minimalist template. The backend is where you’re going to spend a lot of time. Setting up the site, posting to your blog and managing an online store are all done through Squarespace’s content management system (CMS). Squarespace 7 is a complete redesign of the CMS. The biggest change is that you can now edit your site live. Previously, you had to flick between a settings page and the site preview. Now they’re integrated into one good looking (and functional) editor. With WordPress you’re stuck using a basic text editor. Any changes you make aren’t immediately visible and if you’re browsing your site and want to edit something, you have to navigate to the CMS. Now with Squarespace, you’re able to edit directly on any page. If you want to add content — or even correct a typo — it’s a matter of seconds. Using the CMS is really simple. Everything is laid out logically and if you run into any issues, Squarespace has support staff on hand 24/7 to help out. Tweaking your site’s appearance, adding new pages, writing blog posts or setting up an online store are all easy to do. But Squarespace allows for more. It’s possible to design your own themes using Squarespace’s developer tools. If you want to build something that’s completely custom that still uses Squarespace’s great CMS then you can. The CMS is far easier to use than WordPress, especially for people who aren’t tech savvy (like most designer’s clients). Even in stripped down versions of the WordPress backend, there are far more bells and whistles that most users need to see. With Squarespace, your clients aren’t going to have that problem. You’ll never have to explain what Yoast is again — and why they shouldn’t touch it! Another bonus is that Squarespace takes care of the hosting. They even offer packages with unlimited storage and bandwidth. That’s another headache removed. Again, the caveat is that you’ll never get the full flexibility you get with WordPress — all the complexity comes with hundreds of additional, customisable features. If your clients needs go beyond what Squarespace can offer, you’ll have to look at other options. For 95% of people, however, Squarespace is going to cover all the bases. Squarespace is also starting to integrate with other platforms and services. Newly introduced in Squarespace 7, you can add Google Apps or stock photos from Getty Images to your site. Overall, Google Apps integration is great. The best thing though, is that you can have a custom email address that has all the power of Gmail. For the past few years I’ve had harry@harryguinness.com as my email address. It’s really handy having a memorable — and professional — email address. Setting it up using cPanel was a massive pain and I ended up receiving a load of spam. Moving over to Google Apps solved all that. With Squarespace, you can get the full suite set up quickly and easily for an additional $5 a month per user. The new integration with Getty Images is really interesting. For $10 per image, you can license anything in Getty’s library for use on your site. Even better, you can add images from Getty through Squarespace. Great photography is one of the things that takes an average website and makes it stunning. Squarespace has made it simple. Squarespace offers three plans: Personal, Professional and Business. Depending on which you choose and how you pay, they range in cost from $8 to $30 per month. If you sign up for the year you get a domain name included in the plan. They even have a two week, no credit card free trial. For most people, the Personal plan is going to be perfect. You can build a great website for you — or your small business. If you’re looking to build a massive site, sell a load of products or make use of Squarespace’s developer platform you’ll need to get one of the more expensive plans. All things considered, Squarespace is pretty affordable and every package offers value. With my current site, I pay less per year for my domain and custom hosting but it takes a huge amount more work to run. If you’re looking for the cheapest way to set up a site, there are other ways that cost less. But if you’re looking for the easiest way to build a great looking site, Squarespace is probably the way to go. After playing around with it for a while, I can honestly say Squarespace is great — especially for web designers. While I’m not going to move my website to it yet, I plan to redesign it this year and will be giving serious consideration to designing my own Squarespace theme. What I will be doing is setting my clients up on Squarespace. The simpler interface, powerful features and hosting just make it so much more appealing to me than WordPress. As it says at the top of this post, Squarespace sponsored this review. It’s almost a shame they did because some people will consider this an ad rather than a “real” review. If I thought Squarespace sucked I’d say it. I really think it’s this good. How Do I Win A Squarespace Professional Plan? Have us review your apps and services. Contact Jackson Chung for further details. Explore more about: Blogging, MakeUseOf Giveaway, Squarespace.